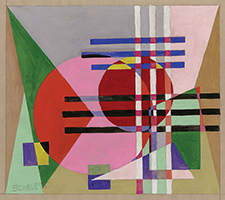 Painter, designer, and printmaker, Rolph Scarlett is known for his important contributions to the development of 20th century American abstract art. Solomon Guggenheim collected many of his works and made him chief lecturer at the Museum of Non-Objective Painting (later the Solomon R. Guggenheim Museum) in 1940, a post which he held until 1949. 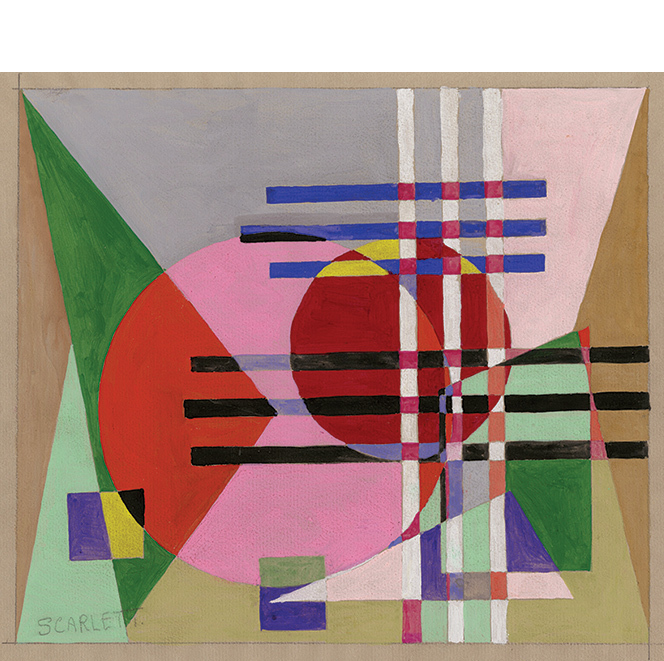 Scarlett's work was exhibited widely throughout his career and is represented in the collections of the Guggenheim Museum, the Whitney Museum of American Art, the Museum of Modern Art, and the Brooklyn Museum. Untitled (Geometric Abstraction with Circles) -c.1940, Gouache. Signed in pencil, in the image, lower left. Image size 9 1/2 x 10 7/8 inches (241 x 267 mm); sheet size 12 x 13 1/4 inches (305 x 337 mm). A fine, modernist, geometric abstraction, with clean, fresh colors, on buff wove drawing paper, with margins all around (1 3/16 inch). Slight skinning on the top sheet edge verso (not near the image), otherwise in excellent condition. Signed R. S. in pencil, lower left, and again in the lower right sheet corner. Image size 4 3/8 x 6 1/2 inches (111 x 165 mm); sheet size 5 1/2 x 8 1/2 inches (140 x 216 mm). 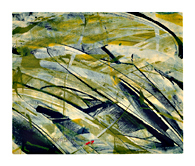 A fine, spontaneous, intuitional abstraction; with fresh colors, on cream wove paper; with margins (1/2 to 1 1/2 inch). Laid onto a backing sheet of drawing paper, folded from the top edge; punch holes on the outside left sheet edge; pencil lines in the right margin, extending into the image, apparently intentional, in overall good condition. 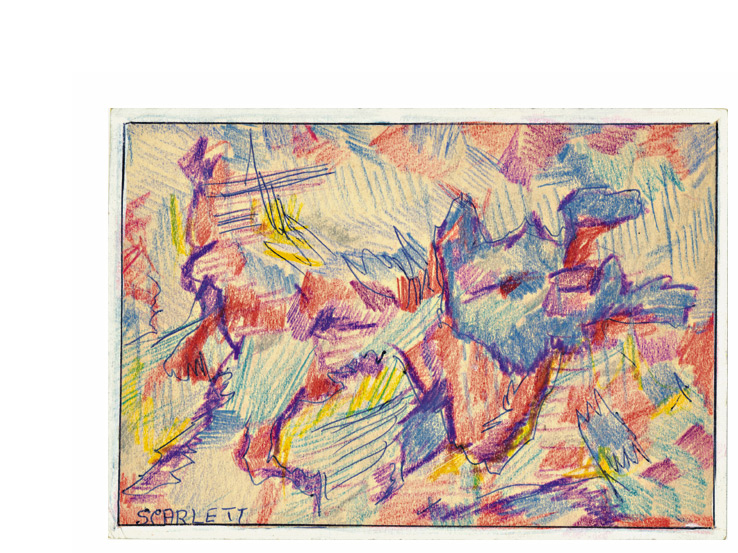 Untitled (Modernist Improvisation 19) - c.1940, Colored Pencil, Gouache, and Ink. Signed in ink, lower left. 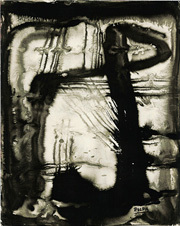 Image size 6 x 8 3/4 inches (152 x 222 mm). 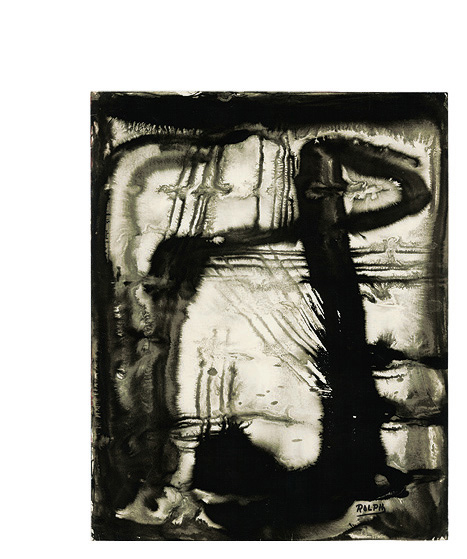 A fine abstract expressionist work, the image extending to the sheet edge, on cream wove paper, in excellent condition. Untitled (Abstract Expressionist Composition in Blue and Green) - c.1940, Color Monotype with Gouache. 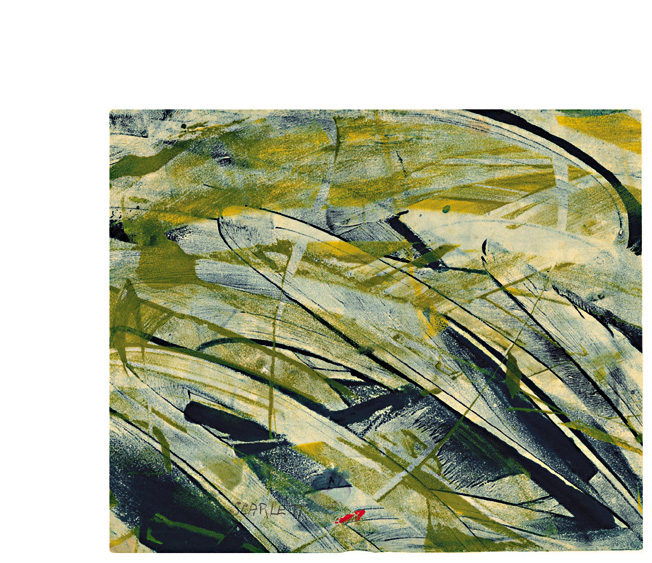 Image size 9 x 11 inches (229 x 279 mm). A fine, painterly, abstract expressionist work, with fresh colors, the image extending to the sheet edge, on cream wove Japan paper, in excellent condition. 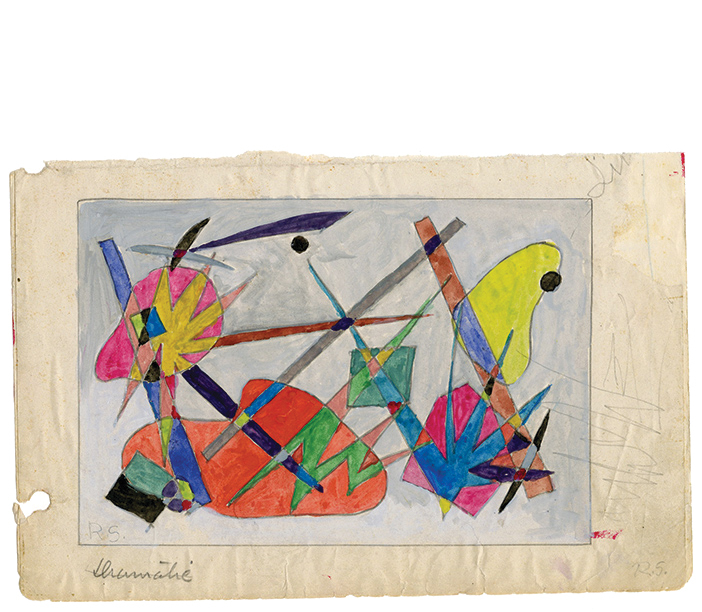 Untitled (Modernist Improvisation 11) - c.1945, Watercolor. Image size 24 3/16 x 19 3/8 inches (614 x 492 mm). A fine, spontaneous, abstract expressionist work, the image extending to the sheet edge, on cream watercolor paper, in excellent condition.